The man who deactivated Trump's account called it a "mistake." The Twitter employee who set in motion the deactivation of President Donald Trump's account in early November has emerged from anonymity to say the whole incident was a "mistake" and he never thought it would actually be carried out. Bahtiyar Duysak spoke to TechCrunch to clear the air over the 11-minute deactivation heard 'round the world. Duysak, a German citizen, was working for Twitter's Trust and Safety division on a work and study visa and is now back in his native country. On his last day at Twitter, he says he received a random user report against Trump's account and out of instinct "put the wheels in motion to deactivate it," according to TechCrunch. He then closed his computer and left the company for good. He claims the whole incident was a "mistake," telling TechCrunch, "If I am involved in this, I really apologize, if I hurt anyone. I didn't do anything on purpose." "I had a wild time in America," he added in the interview. "I was tired sometimes, and everyone can make mistakes." It was only after reading the news later that he realized the gravity of what his one little action set in motion. But Duysak says he never thought, after flagging Trump's account, it would actually be deactivated. "Of course not only one little mistake, one human being, can create such a result," he said. "I think it's all about a number of coincidences." Twitter has previously said that it deems some accounts, including Trump's, "newsworthy" and essentially modifies its usual standards for abuse reports. It's string of tweets on Sept. 25 explained its policy, saying it "considers a number of factors when assessing whether tweets violate our rules. Among the considerations is newsworthiness and whether a Tweet is of public interest." "I didn't hack anyone; I didn't do anything I wasn't authorized to do," Duysak says. 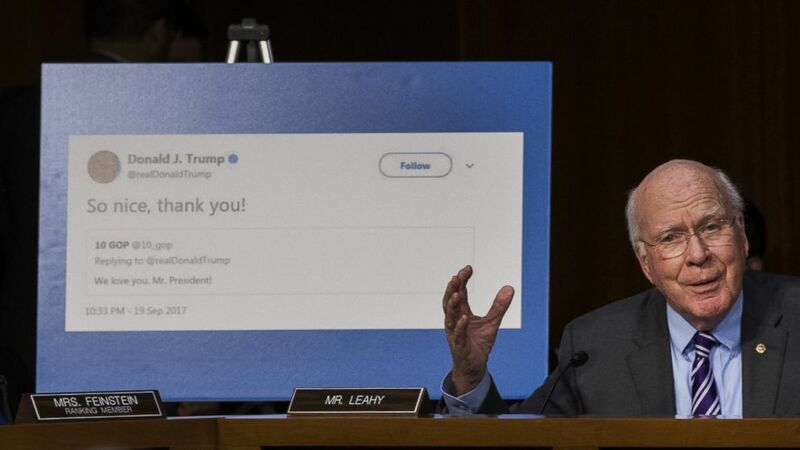 (Drew Angerer/Getty Images) With a display showing President Donald Trump retweeting a fake Russian Twitter account, Sen. Patrick Leahy questions witnesses during a Senate Judiciary Subcommittee on Crime and Terrorism hearing on Capitol Hill, Oct. 31, 2017 in Washington. Duysak says he has revealed himself now because pressure from the media was interfering with his quality of life. "I just want to continue an ordinary life," he says. "I don't want to flee from the media. I want to speak to my neighbors. I want to speak to my friends. I had to delete hundreds of friends [from social media] because reporters are stalking me. They add my friends on Facebook. I had to delete so many pictures, and I just want to continue ordinary life. "I didn’t do any crime or anything evil, but I feel like Pablo Escobar," he added, referring to the infamous Colombian crime lord.